Valencia College will contribute $2 million to the University of Central Florida’s proposed downtown campus, according to plans outlined at the Oct. 21 Valencia College board of trustees meeting. The UCF downtown campus is a joint project for Valencia College and UCF, though UCF is securing the bulk of the funding for the campus. “Just as UCF has invested in our joint-use facilities on West Campus and Osceola Campus, we are going to invest in their campus’s joint-use facility,” said Sandy Shugart, Valencia College president. Dale Whittaker, UCF’s provost and executive vice president, and Falecia Williams, president of Valencia’s West Campus, outlined the latest proposal for the downtown campus in a briefing for Valencia College’s trustees. Under the new plan, Valencia would provide most of the first- and second-year classes at the downtown campus. For students who attend the downtown campus, the cost of a bachelor’s degree would drop from $24,650 (the cost of 120 credits at a Florida university) to $18,920 — the cost of two years at Valencia and two years at UCF. 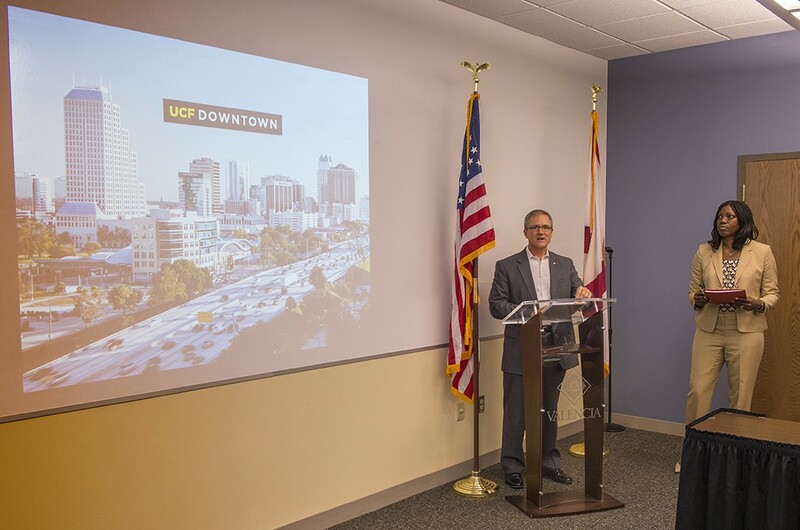 UCF plans to move a number of programs to the downtown campus, including its digital media, emerging media (character animation), health informatics, health services administration , legal studies, communications and social work programs, as well as several master’s degree programs. When the campus opens, UCF officials estimate that about 5,395 UCF students will be enrolled in programs housed at the downtown campus. Valencia College plans to move its culinary and hospitality programs from the West Campus to downtown, as well as part of its digital media program and the college’s health-information technology program. Valencia will also offer the classes needed to earn an Associate in Arts degree, which is the general education degree required for transferring to a four-year college or university. Valencia programs are estimated to bring about 2,300 students to the campus when it opens. 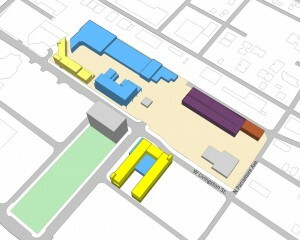 Plans for the UCF-Valencia downtown campus include academic buildings (blue), housing facilities (yellow) and a new parking garage (purple). “This campus will be a game-changer for a number of reasons,” Whittaker told Valencia officials. Not only will the campus provide opportunities to the residents of Parramore, he said, but he noted that the programs moving downtown are aligned with the economic development goals for the city of Orlando and the region. For instance, the health information programs and health services programs will be located between Orlando Health and Florida Hospital’s headquarters, while the digital media programs align with Orlando’s growing tech businesses. Legal studies students will be studying near the county and federal courthouses, as well as the FAMU law school. Valencia’s culinary and hospitality programs will move into 50,000 square feet of space in a building complex that will also house downtown campus students. That housing facility will be privately built, but managed by UCF, Whittaker told the trustees.